When launched in 2016 the entry level RBC Rewards+ Visa Card came out without a sign up bonus. Somewhat rare but not unheard of for an entry level no annual fee card. Now RBC appears to be on an acquisition campaign for the card as perhaps the card isn't meeting the expectations of sign ups as they have added a sign up bonus for the card. 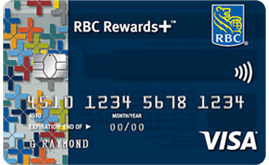 Right now you can get 2,500 RBC Rewards Points when you apply for and receive the card. Those points can then be redeemed for a $25 gift card or $25 toward travel. Those are your typical 100 points = $1 redemption options. There are many other redemption options but they go up in the number of points required per dollar. The card itself isn't a very strong option for rewards. 1% back essentially on Gast, Grocery & Drug Store purchases and 0.5% back everywhere else. It does have other bonus point options when you go digital such as 500 points for providing your email, 500 for receiving eStatements and so on, up to 3,500 more points.